Back cover blurb: Two boys missing. A seaside community with a dark secret at its heart… Two little boys go missing out at sea – and only one is brought to shore. For the boys’ mothers, best friends Sarah and Isla, the tragedy splinters a friendship. And The Sandbank – once an idyllic seaside haven – becomes a place of ghosts. On the anniversary of the drowning, the other boy is missing. Parents Nick and Sarah try to quell their panic, but the Sandbank hums with tension as decade-old memories rise to the surface. The truth lies in the past, like broken glass buried in the sand. Someone is hiding something – the question is, what did they see? Last Seen is a twisty turny delight of a novel. Opening with the rescue of someone stranded out to Sea (we don't find out who until much later in the novel) and the suggestion that there is another person out there, still stranded. Sarah and Isla practically grew up together on the beach near their home, and dreamed of owning beach huts next door to each other when they were older. Fast forward a decade or so and there they are on the beach next door to each other, perfectly manicured beach huts in tow. Isla is a single Mum to son Marley, and Sarah is married to Nick, they too have a son, Jacob. Marley and Jacob are best friends like their Mothers. Until one day a tragedy splits the boys apart, with Jacob safe and Marley nowhere to be seen. Isla and Sarah's friendship is changed forever. However friends they do remain and continue to spend their summers together at the beach huts. When Jacob goes missing the morning after his Eighteenth birthday, Sarah is certain that someone knows where her Son is. But then she remembers how Isla was after Marley's disappearance and is determined not to split the beach community apart however much she wants answers. Her so called best friend Isla is out of the country, Jacob's girlfriend is behaving oddly, her oaf of a Father being vile and Sarah struggles to know who to turn to for the answers she so desperately wants. Told from Isla an Sarah's alternate points of view, it is difficult to know exactly who to believe and who to trust. Last Seen is a clever novel that really explores some complex family and non family relationships. 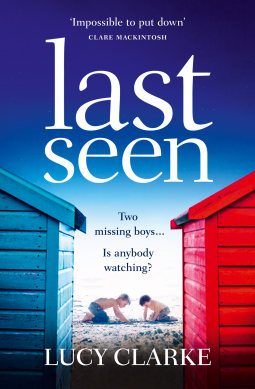 Last Seen is available from 29 June 2017.